Refers those tattoos that represent Buddhas face in that it is a representation of faith and loyalty towards others.It also preaches the ideology followed by Buddha. Mandalas tattoos, also known as Mandala Wheels, it has a beautifully intricate designs that are believed to portrays the universe. Every Mandalatattoos starts with a core geometric figure. Mandalas tottoo are often used to assist focus during periods of meditation. It is a great design of the tattoo that looks marvelous on the skin. They carry a lot of significance and meaning since the bodhi tree was under which Buddha received alignment.If you happen to live among the people who practice Buddha you will realize that it is won and liked by many. 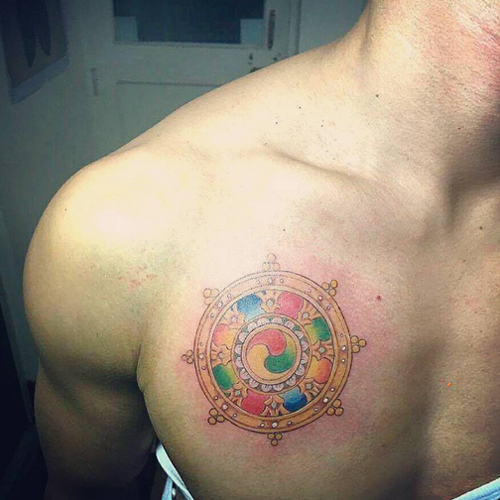 Dharma wheels tattoo are similar to Mandalas but hold a totally different meaning. The Dharmachakra, as it is known, is used to represents the Law and Wheel of Truth, which the Buddha would use it to signal the start of a new cycle of teachings. Turning the Dharma is perceived to change the course of destiny, for instance the way the wheel changes the direction of a sailing vessel. It is believed to be associated with the Lotus. It is used to communicate a language of unity and purity among the people.It is very popular among the Buddha community as it usually looks amazing the skin.